"The most Advanced Yelp Scraper on the Market - Hands Down." Taken from our amazing Local Scraper, the Yelp Only Scraper is the same amazing scraper included with Local Scraper. 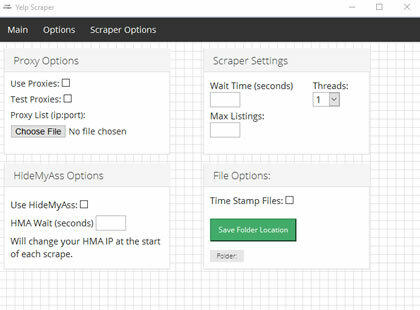 This product is for users that want data from Yelp but don't the other scrapers included with the Local Scraper Package. Its been pulled from Local Scraper but hasn't lost any features. 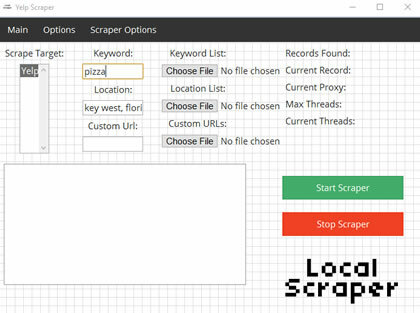 You get our best scraper available and all of its amazing features. The only limitation is that this scraper will only work with Yelp. 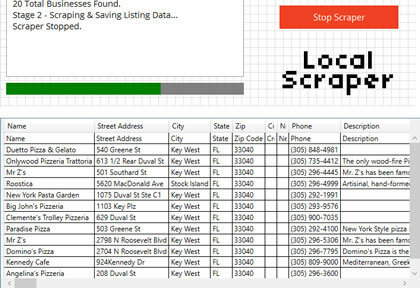 Our Yelp scraper is the most feature packed scraper on the market. We gather 48 fields of data from Yelp. Nearly every business detail listed on the site will be at your command. Below is just a sample of the data you could be gathering. So what are you waiting for? In just minutes you could be gather data! 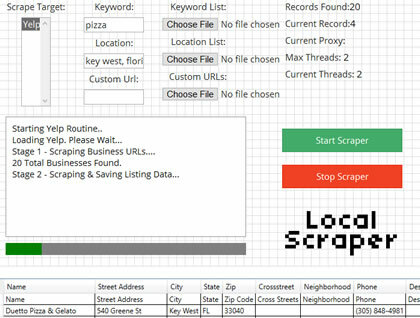 Yelp Scraper is included in the Local Scraper Package and sold separately on this page. The payment option below is for a single license of the Yelp Scraper only. Your order is a 6 month subscription and insures you always have the latest and greatest version of our Yelp Scraper. Get instant access to Yelp Scraper for only $29.99! * Yelp Scraper only supports Windows OS. ** Your purchase is for a Single License of Yelp Scraper. Your Single License allows you to install the program on two computers. Are you only looking for Unverified Businesses Listings at Yelp.com? Then check out Yelp Unverified a new custom built scraper just for you! Click here for details.